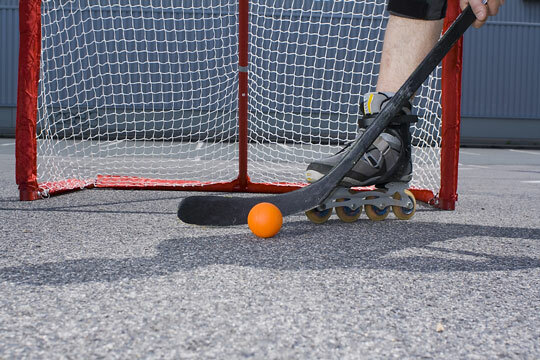 There are several forms of hockey including ice hockey, field hockey, indoor hockey, and roller hockey. All forms are played recreationally, but ice hockey is a popular professional sport as well, most notably in Canada. The game is on strong footing, but that doesn't mean it's bound to take off. Shane Ryan. Golf Digest. Monday, 22 Apr 2019 12:59:06 +0000. Jagger Benson, a 6-foot-2 blue-liner from Tilton Academy, and Eli Barnett, a 6-foot-5 15-year-old from Canada, talk about committing to Vermont. Ted Ryan, Free Press Correspondent. Burlington Free Press. Friday, 19 Apr 2019 10:07:26 -0400. Ice hockey is an Olympic sport and team game with six players on a side, including three forwards, two defenders, and one goalie. It is played with sticks and a rubber puck on a rectangular sheet of ice called a rink. A regulation rink is 200 feet long and 85-100 feet wide, and divided in half by a red line, and into thirds by blue lines forming two end zones and one neutral zone. The NHL (National Hockey League), USA Hockey, and NCAA specify rules that govern the game of ice hockey. Although it is assumed that games of hockey have been played in some form around the world for 4,000 years, the historical roots of ice hockey are Canadian. The game took off in Montreal during the winter of 1879, when W.F. 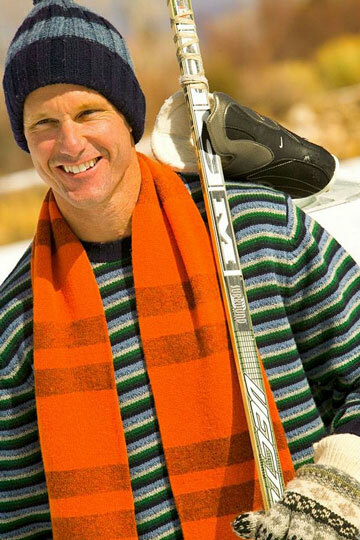 Robertson, an avid skater, sought to find a way to play the game of field hockey on ice. The first games were played nine to a side, using a square rubber puck. The first team, known as the McGill University Hockey Club, was formed in 1880, and the game was later introduced in Ottawa. Play is started by a "face-off," during which the referee drops the puck between the sticks of the opposing centers in the middle of the rink. The other players must remain at least 10 feet away from the center players during the face-off. There are also eight other marked spots on the rink where face-offs take place if play is stopped during the game. The puck remains in play until it is hit across the goal line or the whistle is blown on an infringement. When a goal has been scored, a red light behind the goal is switched on. The puck may be stopped by a player's stick, hand, body, or skate, but the puck cannot be held for more than 3 seconds. "Stick-handling" refers to using the stick to maneuver the puck. Infringements such as charging, tripping, or body-checking are penalized by sending the offending player off the ice and into a special penalty box for two or more minutes. Fighting is penalized by five minutes off the ice, and deliberate injury is penalized by ten. The puck is 3 inches in diameter, 1 inch thick, and made of vulcanized rubber, weighing approximately 6 ounces. The hockey stick is made of wood, aluminum, or graphite and has a thin, rectangular shaft from 4.5 to 5 feet long. The blade is 2 to 3 inches and less than 12.5 inches long. It is curved slightly in one direction, allowing for better puck control. The goalie stick widens halfway down the shaft, to a maximum of 3.5 inches. Helmets are worn with or without face guards, as well as gloves, shoulder, elbow, shin and knee pads under a uniform featuring the player's number. 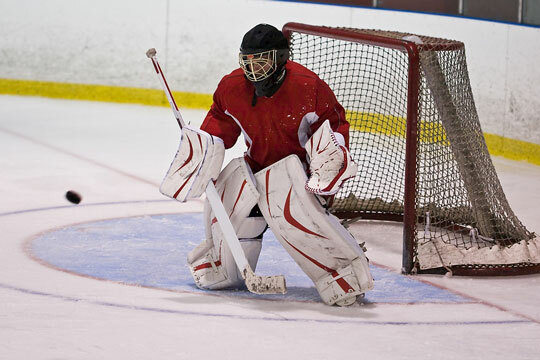 Goalies also wear chest protection. Ice hockey skates are made of hard plastic and well padded with lightweight metal blades approximately 2 inches in height. Field hockey is a form of hockey played in over 70 countries with teams of 11-a-side, although some teams play with 5, 6, or 7-a-side. Teams include a goalie, two backs, three halves, and five forwards. It is usually played on a grass field 100 yards long and between 55-60 yards wide. The normal game duration is 70 minutes, with two periods of 35 minutes each. The object of the game is to use the sticks to hit, push, flick, or scoop the ball into the opponent's goal. Opponents attempt to intercept the ball. The goal is constructed of two posts 4 yards apart joined by a horizontal crossbar that is 7 feet off the ground. Netting contains the balls that have been shot past the goalie. The ball, which is made of solid plastic, has a circumference of 9.25 inches and weighs 5.5 to 5.75 ounces. Field hockey players wear shirts, boots without spikes, and shorts or a skirt. The goalkeeper wears a face guard, gloves, headgear, and knee and elbow pads. Indoor hockey is similar to field hockey, but adapted for indoor play. However, the manner of play can also be utilized outdoors as well, on a flat, hard surface such as asphalt. A regulation playing area is between 40-50 yards long and 20-25 yards wide. There are two teams comprised of six players each, and the game is usually divided into two periods of 20 minutes each. Indoor hockey rules are set forth by the International Hockey Federation which states that the ball must only be pushed and not hit with the stick. The ball may only rise off the ground when attempting to score a goal from the striking circle (a delineated area in front of the goal). The game is started by a lateral pass from the team losing a toss-up. Roller hockey may be played on roller skates, or more commonly, roller blades. This variety is referred to as inline roller hockey. It is played with two teams of 6 players, and closely resembles ice hockey, though played on asphalt or an indoor skating rink with a ball. The rink or playing area must be a minimum size of 65 x 35 feet and a maximum size of 100 x 200 feet, surrounded by a barrier. As in indoor hockey, play starts with a face-off after a coin toss. The six players on each team include a goalie, center, two forwards, and two defenders. There may be up to 14 players which can be substituted throughout the game. The stick may not be raised above shoulder height. The game is played in two periods of 10, 12, or 15 minutes. Players wear matching jerseys, as well as helmets with a chin strap, a face mask, hockey gloves, and shin guards. A mouthpiece may also be used but is not required.